The Dorotheum Auction House in Vienna chose a polished frame with carved and gilded decoration for their painting of a musical group by Platzer. 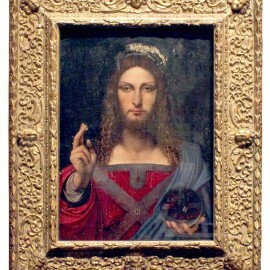 The painting went on to sell for over twice its estimate at EUR317,500. The Musée des Beaux Arts de Montreal chose a carved and gilded auricular style frame for a painting of a woman at a virginal by de Witte.